Some folks should never be in a kitchen when bored. I may be one of those people. You see, it was in the run up to lunch time, late morning. I was thinking that it was time to put the potatoes in the oven if I wanted to have them with my lunch. If you're counting on me for a baked potato recipe, it's 450F for 1 hour 15 minutes "Or Until Tender". I usually go with smaller potatoes because they're typically what are "medium" in this inflated garden basket of food called America. Don't look at me that way Europe, you lot are just about as fat as most Americans are here, and I'm decidedly not fat. They run about 1.1 calories for 1 gram of Potatoes on average. I went with 300 calories worth of potatoes. I was going to split them in two and eat them over two meals anyway. But I was bored with baked potatoes. I started slicing them. I have a habit of having the knives of death here - they're sharpened to a professional edge. If you ever use a knife here at my house ... be very careful. I selected my favorite steak knife. It's about an 8 inch blade, not serrated, and deadly sharp. Drew the knife back on the cleaned potato and it gave me a slice that was ridiculously thin. Repeated it through the two potatoes. 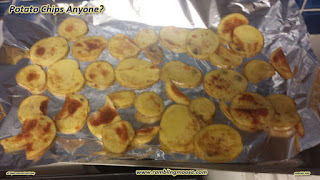 Instead of getting a "comb" of potatoes connected at the bottom so that I could make a Hasselback Potato, I ended up with passably thin potato chips. Some were thicker than others, most were translucent. I guess I have a heavy hand when it comes to that kind of precision slicing. Still getting used to how sharp these knives are myself. I put the potato slices in a plastic bag, then added two tablespoons of olive oil. Shaking the bag I made sure they were coated. That yielded two servings, 250 calories a piece. Standing at the stove, I thought. Now, that never is a good thing. Either put them on a sheet of aluminum foil, or try to pan fry them. It's May in Florida. Mid to upper 80s that day. A bit warm to put that much heat in the house by running the oven, I got out the Electric Griddle. Not quite. The thinnest ones cooked almost immediately, the thicker ones were a bit soft in the middle. I did this by eye. Once they started to brown up, I flipped and repeated. The entire griddle was covered with little "coins". Golden coins of Potato Goodness. Muwahahah, My mind thought! If Only It Were Real! Right, Scrooge McDuck? I think they took about 3 minutes to cook per side, this was the fastest way I had ever discovered to make potatoes, and since I controlled the oil, I could control the calories. Luckily, I had a "small" breakfast that day. Only 400 calories when I budget 600. Yes, I count EVERYTHING. I "snuck" a chip. Needed a wee bit of salt. But... these were GOOD. I tried another one. Another, and another. I was in trouble. There went my 200 calorie cushion. I stopped midway through the cookie sheet. I was like the cookie monster with these chips. Fresh off the griddle, they were good! I washed up the griddle, cleaned up the kitchen and walked away. At lunch time I devoured the rest. Ok, so the thick ones were cold and not crispy, the thin ones were crunchy but this was a start. "Ten out of Ten I'll do it again!" I told myself. Next time... Thinner! Yeah that's the ticket! Thinner! Use the Mandolin Slicer you Simple Moose! I had once had an actual company tour at a potato chip factory years back. They fry their chips in an oil bath. Seemed to me a bit imprecise, but they also got a more uniform and predictable result. If you want to take shortcuts you'll end up with variations. That's what I see in every recipe I have made. This one was shortcutted from the start. I was playing in the kitchen, entertaining myself with food. I know many people who say they can't cook or won't try. It's all about giving yourself the freedom to fail. If Failure Is An Option, Success comes with a Gift of Knowledge. Mom was wrong, Play With Your Food! Go ahead! You may just find that you are learning a valuable skill for your future. Oh sure, there are people who never use their kitchens, save for storage. Hanging their laundry where they should be browning meat, or some other such activity. Silly people, you'll never know! In the meantime, I have to plan out a pork dinner. Cooked to 145F. Now, what kind of cuisine? Mexican? American? Chinese? That's what I gave myself years ago, the joy of allowing myself to come up with a mistake from time to time. You never know what you'll get when you experiment, do you?